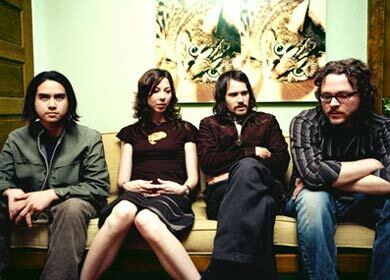 Silversun Pickups Biography, Discography, Music News on 100 XR - The Net's #1 Rock Station!!! Hailing from Los Angeles, California USA, Silversun Pickups is an Alternative-Rock band which consists of singer + guitarist Brian Aubert, keyboardist Joe Lester, bass player Nikki Monninger and drummer Christopher Guanlao, longtime friends who played together or in mutual friends' bands before they finally settled on a Silversun Pickups line-up and began playing shows at local clubs. Dangerbird Records signed them for an EP in 2005, a 6-song set called "Pikul", crammed with polished versions of many live favorites. These songs sealed in the love among Silversun Pickups' L.A. fans and critics and their subsequent mounting acclaim led the band to undertake an increasingly heavy touring schedule, which found them playing alongside Black Rebel Motorcycle Club and others outfits. In July 2006 they released their debut full-length CD, "Carnavas", which deduted at #5 on the U.S. Top Independent Albums chart while later reached the upper half of The Billboard 200. They also had two singles on The Hot Modern Rock chart: "Well Thought Out Twinkles" peaked at #9 and "Lazy Eye" at #5. The final single, "Little Lover's So Polite", released in early 2008, was minor hit. 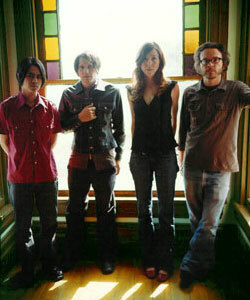 Silversun Pickups returned with its sophomore release in April 2009 going straight into the top 10 of The Billboard 200. The first single from the album, "Panic Switch", hit #1 on The Hot Modern Rock chart and was followed by the top 20 hit "Substitution" and "The Royal We" which peaked at #5 on the same chart. In the fall of 2011 the quartet put out a 10-inch vinyl EP entitled "Seasick" which features three previously unreleased cuts from the "Swoon" recording sessions; "Broken Bottles" took them back into Alternative radio top 40 list. The '90s-style L.A. dream-rockers' third full-length disc, "Neck Of The Woods", arrived in May 2012; it crawled up to #6 on The Billboard Top 200 Albums chart and peaked just outside the top 10 of the Canadian Albums list. The first single, "Bloody Mary (Nerve Endings)", quickly catapulted into the U.S. Alternative Songs chart with a peak of #7. The second single hit #3 on The Hot Modern Rock chart and was followed by another top 30 entrant, "Dots And Dashes (Enough Already)". 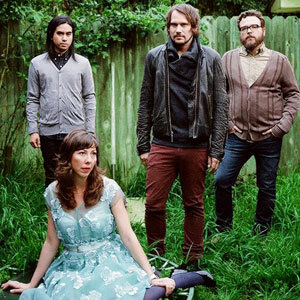 Silversun Pickups will close out their ten-year run with Dangerbird Records by releasing "The Singles Collection" on February 25, 2014. The set features eleven songs, including the brand-new track "Cannibal".